Fast racing daysailer with advanced systems, contemporary styling, and a minimum interior, capable of family fun or winning on the race course. 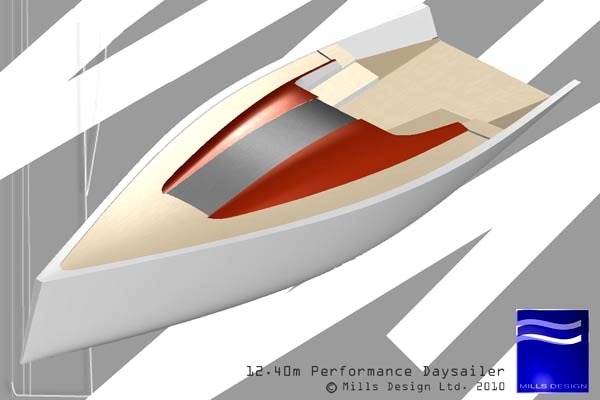 This proposal for a high performance daysailer combines stunning good looks and a simple and practical layout with a proven race winning design configuration. It offers safe fun daysailing either shorthanded or with family and friends as well as the capacity to excel on the race course under IRC. 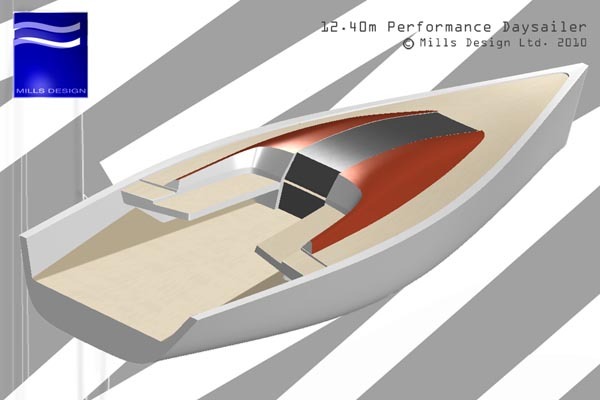 Integrating some advanced features such as the backstay-less rig and cantilevered seats this design promises to be a head turner at the dock and underway. Starting with a slim easily driven hull shape evolved from a successful design lineage including IRC racers such as Mariners Cove and the King 40, the weight and beam have been reduced to ensure a smaller easily handled sailplan will still provide sparkling performance. A large lead bulb supported by a deep cast SG iron fin ensures a stable and comfortable platform even without crew on the rail. Accessed by a low-silled companionway the simple but complete contemporary interior provides a comfortable place to relax or escape a summer shower, lit by the glass centreline panel which runs the length of the coachroof from cockpit to foredeck, and optionally portlights in the hull sides. With a small galley, enclosed head, and refrigerator or ice-box all the amenities for leisurely daysailing or weekending are present. On deck the styling notes produced by the sleek ‘floating’ coachroof contours, the glass centreline panel, and the cantilevered cockpit seats combine with the blonde teak deck and a classic sheerline for a strikingly handsome yacht. Beneath the styling however are the systems to ensure she can be sailed and raced effectively by a small crew. Solutions such as a novel halyard routing out of the rig above deck leading outboard to run underdeck to clutch banks by the 2 large optionally powered winches in front of the wheels, underdeck jib and spinnaker sheet leads, and underdeck jib roller furling mean that all the necessary controls are immediately to hand by the wheel without any intrusion to the clean deck and cockpit layout. The large secure cockpit with comfortable seating behind the coamings provides a secure space for non-sailors to enjoy the experience, has easy access fore-and-aft between the twin wheels, and is open aft to allow easy access from the stern. Forwards a foredeck locker hides the jib furler and a solid mooring arrangement allowing secure use of a mooring bridle through small topside access ports. The rig is designed to combine ease of use with high performance, dispensing with a fixed backstay to allow a larger-head mainsail design. This simplified configuration allows the owner to step onboard, raise the main and jib, loose the mooring and be sailing in minutes with only two strings to pull. A deck-stepped version would be a possibility allowing an even more open interior. A masthead spinnaker can be flown from the projecting bow most easily using a spinnaker furler, or with a small flush-retracting bowsprit a more race-oriented sail could be flown with better extension. Construction is envisaged as e-glass over foam, but a cedar strip hull with foam/glass deck and internals would be a very cost-effective option. The basic powering suggestion is a 40(28)hp diesel with saildrive, but new eco-friendly battery or diesel/hybrid options are available for a silent and efficient alternative.